Experience the authenticity of the original Tod Mountain Ski-in and Ski-out by the famous 3000 vertical foot, Burfield Chairlift. These condominiums were the first built on the ski hill site when Tod Mountain (now Sun Peaks) opened up as a community ski hill back in the early 1970’s. Extensively renovated, they are now situated in an ideal location for people that want to be somewhat removed from the busier village centre but yet with true ski-in/ski-out access. 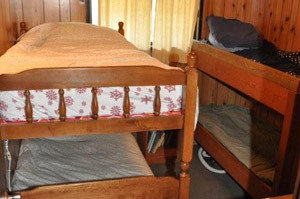 The rental location gives you a total living space of 700 square foot: 2 bedrooms (one with a King Size bed, one with two bunk bed sets), a small loft with a Queen Size bed, and a very comfortable pull out couch in the living room. 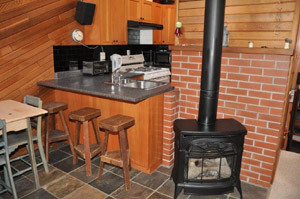 The kitchen is fully equipped with a gas cooking range, full fridge/freezer and microwave. 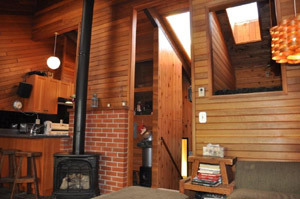 The heating system is electric with a central gas cast iron fireplace and a heated tile flooring. Five large skylights allow good daylight into the unit. 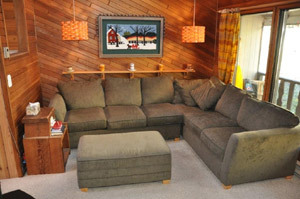 It’s an ideal accommodation for a family ski vacation. The Burfield Condo can be found on the South facing side of Sun Peaks ski area, middle row on the mountain side. Parking is not specifically assigned to each condo, therefore you can use the top parking area or the lower area as well as along the road access. The walk to Sun Peaks’ main village centre is serviced by a plowed village valley trail taking you through forested paths, it takes approximately 20 minutes at a leisurely walking pace (or a 2 minute drive to the village centre). Once in the village a multitude of activities can be enjoyed daily such as the outdoor pool & SPA, open air skating, Nordic ski trails, dog sledding, snowmobile tours, shopping and dinning etc. No smoking inside the unit as well as a no pet policy, thanks! An availability calendar is below for you to check out. 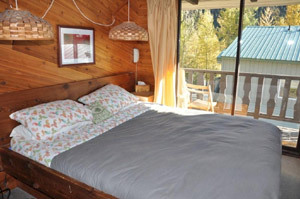 For more information on longer term rentals, 28 days or longer, especially during the months of April to November, please call or text 250 674 0001 or email info@riveradventures.ca for discussion on this unique rental opportunity.